When Beyoncé delivered a provocative Super Bowl halftime show performance in January, it was celebrated by some but deemed controversial and even anti-police by others. Although few were able to articulate exactly why, some settled on the fact that she created a subtle homage to the 50th anniversary of the Black Panthers -- the iconic radical social justice organization -- by having her back-up dancers don the group's signature black berets. 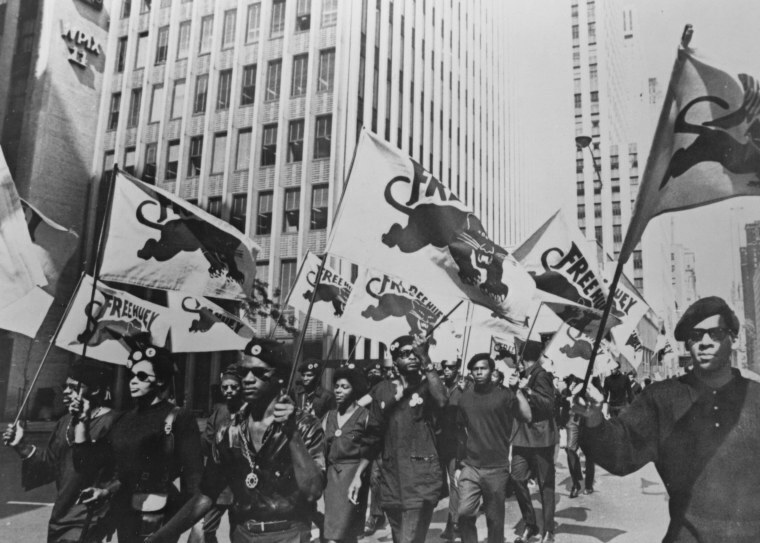 Today, although the original organization has long been defunct since its late '60s-early '70s heyday, the Black Panthers still instill a degree of fear and anger in some segments of America. The relatively small organization had tremendous reach and influence -- at their peak they had 68 field offices around the country -- which led to an unprecedented federal effort to eradicate them. Former FBI director J. Edgar Hoover infamously called them "the greatest threat to the internal security of the country." Although their often overlooked free breakfast programs helped feed thousands of needy children, particularly in the Bay Area, their legacy is always inexorably linked to violence and supposedly anti-white rhetoric, even though the Panthers had and actively cultivated white allies. So why does the very image of the Panthers still induce such anxiety? Bryan Shih, co-author of "The Black Panthers: Portraits from an Unfinished Revolution," surmises that it may have been the Panthers first major foray onto the national stage -- their 1967 armed demonstration at the statehouse in California -- which he described as a "brilliant public relations move," that had the unintended consequence of making their organization a pariah to the established power structure. "They presented the horrific image to the establishment of blacks that not only carried guns openly, but advocated using them to fight back against racist attacks," said writer and activist Earl Ofari Hutchinson. "They openly espoused confrontations with police agencies, that as we know resulted in well-publicized attacks, shoot-outs and deaths. And, they seemed to present a violence-tinged alternative to the non-violent, legalistic, work-within-the-system approach that was the ethos of the Civil Rights Movement." "The only thing people remember is the leather jackets and guns, not the law books or breakfast programs," added Shih's co-author Yohuru Williams. "The vast majority of Panthers sold newspapers, taught political education classes, and fed schoolchildren, they were not having confrontations with police." According to Princeton University Prof. Eddie Glaude, attempts to marginalize the Panthers were born out of a "deep and abiding fear of divine retribution for the sin of slavery." "There’s this worry that black militancy is always a harbinger of black revenge," he said. Still, despite sustained efforts to destroy the Panthers -- sometimes from within -- their image and principles have endured and Glaude argues that their defiant posture, their ability to mobilize and their use spectacle to make their voices heard, changed black politics forever. "There is something about that moment that captures our imagination," he said. According to Williams, you can also see the fingerprints of the Panthers in practical ways as well, in social programs like Head Start and the community health centers they established, some of which exist to this day. In recent years, there has also been a perhaps inevitable desire to link and conflate the Black Panther Party with the similarly youthful and unapologetic Black Lives Matter movement, especially since calling for law enforcement accountability in cases of excessive force is such a vital pillar of both their messages. But former Black Panther Party chairwoman Elaine Brown has bristled at the comparison, recently telling UK website Spiked-Online.com that she doesn't "know what Black Lives Matter does" and that the movement has a "plantation mentality." "There is no comparison," she said. "The next wave of young people running out here, who are complaining and protesting about the murders of young black men and women by the police all over the country, they will protest but they will not rise up in an organized fashion, with an agenda, to create revolutionary change… We advocated community self-defense organizations to be formed, so that we would not be assaulted by the police, so that we would bear arms and assume our human rights." Still, Shih argues that there is some give-and-take between the two generations of black activists, and that Black Lives Matter leaders -- who are able to utilize technology to help justify their moral outrage in a way the Panthers couldn't -- have made a concerted effort to learn from their predecessors' pitfalls. Like the Panthers before them, he says the Black Lives Matter movement is going through great pains to control and define their own image. "People are looking for role models and only now is a full picture of the Panthers starting to come out," he said. "The more scandalous or audacious part of Panther history have been well-mined. But there is till so much more to look at."